"WarioWare" redirects here. For information about the in-game company, see WarioWare, Inc.. For the Super Smash Bros. stage based on the series, see WarioWare, Inc. (stage). WarioWare, known in Japan as Made in Wario (メイド イン ワリオ Meido in Wario), is a series of comedy-based party games published by Nintendo and featuring Wario. A series within the Wario franchise, it was introduced in 2003 with the release of Mega Microgame$! for the Game Boy Advance. While the first two games were developed by Nintendo R&D 1 (now part of Nintendo SPD), subsequent games have been co-developed by Intelligent Systems. The games in the series are collections of very short and simple games, called "microgames" or "minigames," presented in quick succession. The plot centers around Wario founding the video game studio WarioWare, Inc. and hiring numerous friends of his to develop the microgames for him. The WarioWare games often make use of the new technological innovations of the console for which they are released. WarioWare is a collection of short, simple games, called "microgames," presented in quick succession. Each of the microgames lasts about three to five seconds and failing to complete it costs the player a life. The games may seem simple; for instance, a microgame may require the player to pop a balloon, pick a nose, zap a spaceship, or make Wario collect coins in a maze styled after those in Pac-Man. The numerous microgames are linked together randomly and steadily increase in speed and difficulty as the player progresses. On each level, players are allowed four losses only. Also frequently appearing are boss games, which are considerably longer and more complex than the other stages; upon completing these, the player can regain a lost life (with a maximum of four). In addition to the microgame stages, WarioWare games also feature unlockable extra modes and "full" minigames. The plots of these games center on Wario, his company WarioWare, Inc., and his friends in Diamond City who develop microgames for his company. Because of his greed, Wario usually refuses to pay his friends, despite the high success of the games. Most games in the series include short stories in the form of cutscenes dedicated to each of the developers, telling about their adventures or everyday lives. These cutscenes are split into two parts, the first one shown before the developer's respective microgame stage, and the latter part appearing after the player beats the stage. 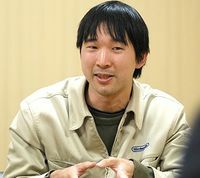 Goro Abe, a key figure in WarioWare game development. The Nintendo 64DD title Mario Artist: Polygon Studio featured a side mode called "Sound Bomber" which challenged the player to survive a rapid succession of very short minigames that increased in speed and difficulty as the player progressed. According to Goro Abe of Nintendo R&D1's WarioWare All-Star Team, the first WarioWare came about when the team decided to make a full game around the concept..
"Sound Bomber" was created by Kōichi Kawamoto as his first assignment at Nintendo, though Kawamoto himself was uninvolved in the WarioWare games proper outside of credits for his work on Polygon Studio. Teammate Yoshio Sakamoto continued, "To add on that, we got the idea of using Wario and the other characters because we couldn't think of anyone else who would be best for the role. Wario is always doing stupid things and is really idiotic, so we thought him and the rest of the characters would be best for the game." The original WarioWare was developed by a team of newer Nintendo staff members, some of whom had previously worked on Wario Land 4. Both games shared the same director: R&D1 veteran Hirofumi Matsuoka, who would leave Nintendo following the game's completion. Abe, who programmed and designed the original game, directed all later entries except for Snapped!. Sakamoto, a longtime member and manager on the R&D1 team, was involved in development of all but the first installment and WarioWare Gold, and took on the role of producer starting with Twisted! Artist Ko Takeuchi designed Wario's "biker" outfit and created the original characters that appear in the series.. Other major figures in the development of the series include Intelligent Systems employees Taku Sugioka and Naoko Mori who acted as sub-directors and designers for most of the games. Since WarioWare launched on Game Boy Advance, every Nintendo system from the sixth generation onwards has contributed an entry of its own to the series, with each new installment often making use of the new technological innovations of the console or handheld for which the game is released. Game Boy Advance WarioWare, Inc.: Mega Microgame$!, known as Made in Wario in Japan and WarioWare, Inc.: Minigame Mania in Europe, was the first installment in the series, and the first full-fledged game release to focus on a series of brief games presented in a hectic format. Its success led Nintendo to commission a port for the Nintendo GameCube, called WarioWare, Inc.: Mega Party Game$!, which was released in 2004 and features multiplayer support. Game Boy Advance WarioWare: Twisted!, known as Turning Made in Wario in Japan, has its microgames take advantage of the Game Boy Advance's rotation sensor and rumble feature. Its plot centers around Wario and one of his friends inventing a GBA-like handheld system that only reacts when tilted around. It was the first game in the series to organize microgames around the control scheme rather than around specific aesthetic styles. This game was not released in Europe because the gyro sensor was erroneously believed to contain mercury. Nintendo DS WarioWare: Touched!, known as Touching Made in Wario in Japan, was the first game in the series to be developed by Intelligent Systems. Its microgames generally make use of the Nintendo DS's stylus, touch screen controls, and microphone function. The game also features smaller, mostly non-competitive "toys," unlocked after completing a number of microgames, which too require the use of the touch screen for their tasks to be achieved. Wii WarioWare: Smooth Moves, known in Japan as Dancing Made in Wario, features microgames that rely on the Wii's motion controls. Gameplay requires the player to hold the Wii Remote (referred to in-game as the "Form Baton") in different positions. After the player completes all of the single-player stages, the game unlocks a multiplayer mode, in which only one Wii Remote is used, with up to 12 players sharing and taking turns with it after each microgame is completed. DSiWare WarioWare: Snapped!, known as Projection Made in Wario in Japan, uses the Nintendo DSi's camera to control the minigames. Set in a theme park, this is the first time that Wario was featured for a console launch instead of Mario. The player uses a built-in camera to stand-in for a character in-game, with various objectives including mimicking movements to grab objects, opening a mouth, or catching objects with the head. Nintendo DS WarioWare: D.I.Y., known in Japan as Made in Me, allows players to create their own microgames as well as play some premade microgames with the Super MakerMatic 21, a machine that can also make music records and 4-page black-and-white comics. When Wario is amazed by this invention and its potential to make huge fortunes, he restarts his company, but many of his employees have quit, so he decides to have the player make the games for him. The minigames made in the DS game can be uploaded to WarioWare: D.I.Y. Showcase (in Japan, Play Made by Me), a game available through the WiiWare service. D.I.Y. Showcase features downloadable post-release updates and an unlockable versus mode where minigames are played in a shuffled format. Wii U Game & Wario, described as a "spiritual successor" to the WarioWare series, features various games utilizing the Wii U GamePad, including its touch screen, motion controls, and camera. Instead of the typical microgames, this particular entry features a set of sixteen more elaborate minigames (12 single-player titles and 4 multiplayer ones), as well as a capsule machine called the "Cluck-a-Pop" which can be used to unlock additional content. Game & Wario also introduces a new artistic direction, under which most characters are slightly redesigned. Nintendo 3DS WarioWare Gold, named Made in Wario Gorgeous in Japan, was the first entry in the series to see its first release in a Western territory, in its case in Europe. It features a total of over 300 microgames (the most featured in any series entry to date), consisting of microgames returning from each of the previous games in the series in addition to new ones. The games involve multiple functions: from pressing buttons to tilting the system, from touching the touch screen to blowing on the microphone. Gold also features full voice acting, the first WarioWare game to do so, with an additional feature allowing players to overdub their own voice over the game's cutscenes. This game is also notable for having a more unique plot compared to other WarioWare games. It begins with Wario stealing a golden pot from the village of "Luxeville." Realizing that he is completely broke, he views a TV report on the success of a new video game, then capitalizes on this by hosting a video game tournament with a huge reward to the victor. Unbeknownst to him, a small girl named Lulu is pursuing him in an attempt to retrieve the pot he had stolen, which at the end of the game is revealed to be nothing more than a toilet. DSiWare This DSiWare game is a remake of the minigame "Pyoro" that appears in Mega Microgame$! In the game, the bird Pyoro uses his long tongue to eat beans which can destroy parts of the ground, while also trying to avoid getting hit by them. This game also remakes the original minigame's sequel, in which Pyoro spits seeds at the beans instead. DSiWare Paper Airplane Chase is DSiWare game that is a remake of the minigame Paper Plane from WarioWare, Inc.: Mega Microgame$!. There are three modes unlike in the original minigame: Endless Mode (similar to the original), Time Attack, and Race Mode. In Endless Mode, the paper plane avoids obstacles and gains points. In Time Attack, the paper plane needs to finish the course as quickly as it can. Finally, in Race Mode, two players attempt to race their paper planes. Wario is the CEO of the company. Not content with only the riches he gained over the course of the five previous Wario Land adventures, at the start of the series he views a TV report on video game sales going up, and sees that industry as a potential gold mine for him. So he establishes his gaming enterprise, with the decision to create short microgames as opposed to full-fledged games, for the sole purpose of making a profit for himself. Many of Wario's microgames feature him in some way, often as a player-character or a screen prop. Wario undergoes various transformations throughout the series, such as "Wario-Man," a mock superhero with the ability to fly; the Tiny Wario transformation, carried over from the earlier Wario Land games, which here also multiplies him; Captain Wario, where compared to that form's previous appearance in Wario: Master of Disguise, Wario wears a different color scheme and a full pirate outfit as opposed to just a hat; and in Gold, "Wario Deluxe," a form that has him wear the pot he stole from Luxeville as a crown, giving him red eyes, a gold colored suit, and a deeper voice. Jimmy T. (the "T." standing for "Thang") is a tall, afro-wearing man who is a disco dancing fanatic to the point that he will sometimes dance involuntarily. He is always seen frequenting various hot night spots within Diamond City, such as Club Sugar. At one point, he even had a girlfriend dump him because of his obsession with dancing, claiming that "the rhythm made [him] do it." As the series progressed, Jimmy was given a family, including his parents (Papa T. and Mama T.) and siblings (his brother James and sister Jamie), who also share his love of dancing; and a doppelganger called Jimmy P., whose color scheme is different from his. In Mega Microgame$!, Jimmy's microgames were all based around various sports; in Mega Party Games!, his multiplayer minigame "Survival Fever" instead involved his favorite activity, dancing. Later entries in the series until D.I.Y. gave him and the other developers microgames involving a particular style of gameplay and not a specific visual theme. Additionally, Jimmy and his folks often host levels remixing the games from previous stages. Mona is a high school student who works a number of part-time jobs, which vary from game to game. She is quite adventurous and culturally savvy, and on the negative side, she always seems to be late to wherever she is going. To make up for lost time, Mona often speeds on her scooter and uses the assistance of her animal companions to stop anyone trying to slow her down. Her occupations have included working at a gelato shop, restaurant waitress, pizza delivery girl at the joint called Mona Pizza, bassist, football cheerleader, temple explorer, and photojournalist. The only game not to give her a job is Gold, which instead casts her as a clothing store patron. She is also revealed to have a crush on Wario, and to like money. A business dog called Joe serves as Mona's boss throughout her various jobs. Many of Mona's microgames involve bizarre twists on everyday activities such as tooth brushing, sawing, and nose picking; in Mega Microgame$! and D.I.Y., these are labeled as "strange" games. Dribble and Spitz are two anthropomorphic animal characters ― the former a bulldog, and the latter a yellow cat ― who work as cabbies. They speak with Bronx accents (Kansai in the original Japanese). The cab they drive was constructed at the Crygor lab, and has the ability to go anywhere, even into outer space. Dribble, despite his burly size, gruff appearance, and being a speed demon, is actually quite calm and friendly. Spitz, though smaller than Dribble, is actually his superior, and is more adept at driving than he. The duo's levels generally involve picking up a passenger that seems supernatural and forgetting to collect the customer's fare. Many of their microgames involve science fiction-based or futuristic themes. 9-Volt is an elementary school-age Nintendo fanatic, who owns everything ever made by the company. His microgames are all based on Nintendo products, including not only classic hardware and software, but even games and toys that it manufactured before it went into the video game business. In recent entries, he ventured into the 21st century, covering newer products in addition to older ones. So addicted is he to his games that he often stays up to play past bedtime. He also enjoys skateboarding and, to a very trivial extent, baseball. Orbulon is an intelligent alien of unknown origin who has difficulty with human language, as evidenced by his frequently replacing common words and terms with more complicated descriptions. He has an IQ of 300, and is 2018 years old. Orbulon first intended to conquer the Earth, but after his spaceship crash-landed onto the planet, he settled into life in Diamond City and ended his mission of conquest. Orbulon's microgames often last longer and require more thinking than those of other developers. Many involve counting and finding objects on screen. Dr. Crygor is a quirky scientist who performs wacky and mostly harmless experiments on his private island laboratory in Diamond City. He is 103 years old, and is a cyborg, having various robotic components, though whether they were given him because of aging or a debilitating experiment is unknown. Crygor not only constructed a cryogenic suit for himself, but has also invented various vehicles, programmed the karaoke robot Mike into "the robot that would solve all [his] cleaning needs," and created a diet machine called the Kelorometer. In Touched, he accidentally gets caught in his latest invention and is younger and more fit, with red accents to his costume, as well as a full helmet; these changes remain for part of Smooth Moves. Crygor's microgames have involved nonfictional real-world elements, such as people, animals, or food, in both realistic and non-realistic styles. Kat and Ana are kindergarten-aged ninja twin sisters, easily distinguishable by their differing hair colors (Kat's is pink, Ana's is orange). Kat is more headstrong and dominant, while Ana is timid. Residing in an old-fashioned Japanese-style house in a forest, the two are descended from the Iga ninja clan, and attend Mystical Ninja Elementary as well as Diamond City's own kindergarten. Their names are derived from different portions of the word "Katana," a type of Japanese samurai sword, which is also one of their catchphrases. Kat and Ana adore nature, especially animals and plants, and as such have four pets: Don the Sparrow, Shadow the Dog, Shuriken the Falcon, and Numchuck the Monkey. Because of their aforementioned love of nature, Kat and Ana feature animals, plants, and animals' environments in many of their microgames. They also showcase games that involve drawing objects or lines. 18-Volt is 9-Volt's best friend, who is also a fan of video games. He is an elementary school student like 9-Volt is, despite being considerably larger in size than he. His other defining trait is the boom box he always carries; his loud music gets him into trouble on his first day of school, although he soon finds an admirer in 9-Volt. Ashley is a young witch-in-training who owns her own mansion, is very emotionless, and hardly ever shows positive facial expressions if at all. She often takes trips to places where she can train in the magic arts. Red is her little demon friend, who acts as her loyal assistant and is capable of shape-shifting. Ashley is largely uninterested in activities unrelated to improving her witchcraft; such tasks/interests are typically relegated to Red, who is her polar opposite and a lot more outgoing and cheerful than she is. Despite Ashley's penchant for dark spells and her huge ego, she is shy and lonely and secretly wants more friends. Nearly none of Ashley's microgames reflect her best interest; many of them tend to have bright and cheery motifs or settings. Mike is a karaoke robot made by Dr. Crygor, named for the pair of microphones attached to the stand on his head (and the primary method of control in his initial set of microgames). Despite being a robot built for karaoke, the slightly mad doctor programs him to be a cleaning robot. Eventually, his programming goes haywire when he blows on a pile of dust. His karaoke programming overrides his systems, compelling him to host a party on a faraway planet and hold a karaoke tournament. Mike is critical of his creator's singing talent, dismissing his voice as ninety-nine percent awful. Young Cricket is a serious martial artist who trains through tough conditions as he travels all over, and Master Mantis is his sensei who accompanies him on his journeys. As revealed in their debut game Smooth Moves and in Game & Wario, the duo love dumplings. Penny is the granddaughter of Dr. Crygor, who admires him and wants to grow up to become a great scientist herself. Penny also has a hidden desire to become a famous singer. She sees her grandfather as an excellent scientist, despite also recognizing his eccentric nature. Pyoro is a bird character who appears in almost every game in the series. His name and design are a parody of a mascot used by a Japanese brand of chocolate. Pyoro has his own minigames which can be unlocked by playing every microgame at least once. Pyoro is red and uses his stretchy tongue to dispose of fruits and fend off evil insects that try to destroy his flowers, home, etc., except in Pyoro 2 in the first entry, where he is yellow and spits seeds at the fruits. A fictional video game starring him, when reported about on TV, is Wario's inspiration to found WarioWare, Inc. The Fronks are a strange, yellow, blocky species of creatures that appear constantly throughout the series, in both microgames and cutscenes. 9-Volt apparently even keeps one of them as a pet, calling it "Shag." These creatures come in several rarely-seen alternate forms in addition to their standard design, sometimes being red or blue or having different faces from normal. Manager Joe is a dog businessman and a recurring character in the series who is often featured in Mona's subplots, usually as her superior. His debut was in Mega Microgame$! as the owner of Mona's gelato shop, the "Gelateria." In Twisted!, he is the owner of Mona Pizza. In Smooth Moves, he appears both as a sports announcer during Mona's story and alongside Mona and her friends as the staff of a dumpling stand in Young Cricket and Master Mantis' story. In D.I.Y., Joe runs Diamond Software, the company to which many of Wario's employees (including Mona) defect. Game & Wario features Joe as the editor of the newspaper Mona works for, and Gold casts him as the manager of a clothing store which she patronizes. 5-Volt, known as "5-Watt" in Japan, is 9-Volt's mother, who appears occasionally within the series. In Twisted!, she (being shown only from behind and from the knees down) shouts at 9-Volt to go to bed after he wastes the whole day playing with 18-Volt; then she reappears in silhouette form in the doorway of her son's room, catching him furtively playing with his Game Boy Advance SP under the bedspread. In Touched!, she cameos in silhouette form in the Game Over screen of 9-Volt and 18-Volt's stage. She next reappears in Game & Wario, this time given her name and full appearance; there, she is the hazard the player (controlling 9-Volt) must avoid in the "Gamer" minigame. By Gold, she becomes a major character with microgames of her own that are based on Nintendo games, like those of 9-Volt and 18-Volt. Ken the Reporter is frequently seen on TV shows in WarioWare games. He announces the success of the Pyoro video game in the first installment, inspiring Wario to open his own company, and later comments on the success of WarioWare, Inc. as well. He returns in Touched! as the host of Ear Candy. A lookalike, Rocky the Reporter, also appears in Touched!. A stage based on the WarioWare corporation is featured in Super Smash Bros. Brawl, Super Smash Bros. for Nintendo 3DS and Super Smash Bros. Ultimate. Wario in his WarioWare outfit is seen in Wario Factory Court in Mario Power Tennis. All the European game covers of WarioWare are yellow, except for WarioWare, Inc.: Minigame Mania. Other regions have a different cover color for each game. In the early WarioWare games, Wario's voice clips were recycled from Wario Land 4 while in the later WarioWare games, Wario has a set of unique voice clips. ↑ "In Polygon Studio you could create 3D models and animate them in the game, but there was also a side game included inside. In this game you would have to play short games that came one after another. This is where the idea for WarioWare came from. ", Goro Abe, Kikizo: Nintendo R&D1 Interview April 7, 2006. Video Games Daily. ↑ "E3 2012: Game & Wario Announced". Computer & Video Games. June 6, 2012. This page was last edited on March 19, 2019, at 00:07.